Hey guys! Happy early halloween! Beetlejuice is one of my favorite halloweeny movies, so I decided to give these a shot. 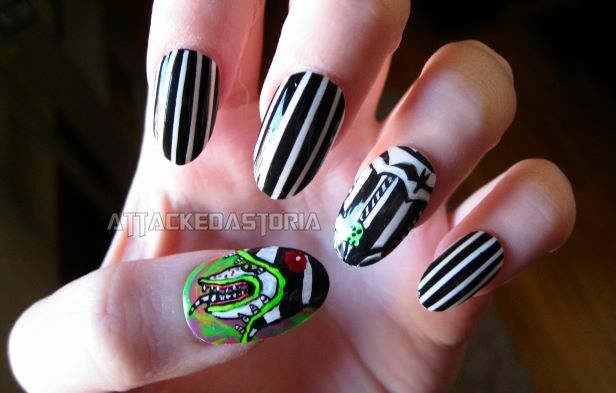 I like how the stripes turned out, the sandworm is okay.. don't like the carousal hat nail. Oh well! And yes, these are obviously on fake nails.. I have itty bitty nubs right now because I broke some nails. :( So sad. I don't have a picture, but the sandworm nail? I used neon acrylic paint and it looks amazing under blacklight.